Kristin Cavallari and Jay Cutler, attend the premiere of Summit Entertainment's "Source Code" at the Arclight Cinerama Dome on March 28, 2011 in Los Angeles, California. Kristin Cavallari wasted no time putting engagement rumors to rest on Monday. 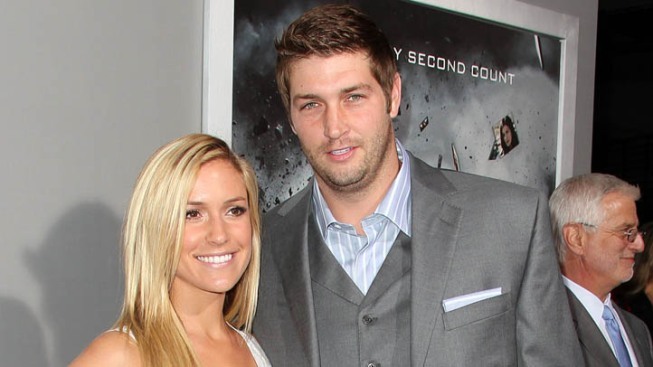 Life & Style magazine reported that NFLer Jay Cutler proposed to the former "Hills" reality starlet a second time and that she accepted. But Cavallari responded via Twitter, saying "New week, new rumor. I'm not engaged u guys." The rumor comes in the midst of a news cycle already dominated by the Chicago Bears quarterback after Cutler fractured his thumb in Sunday's game, putting the rest of his season in doubt. The two were originally slated to get married this spring, but Cutler broke things off last July. In recent months they've appeared to have rekindled the romance, appearing together in public and sending numerous love tweets.